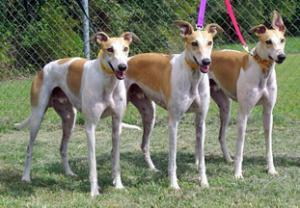 George and his littermates Ethan & Finn have lived together and raced together their entire lives. While it would be wonderful to put them in a home together we know that finding a home for 3 dogs at once would be difficult. We have done a trial separation of the brothers and they all seem to be fine alone too. All three boys are all reported to be as sweet as their name and wonderful, beautiful boys. They are small to mid sized males. Of the three, George is the most active, confident, curious and playful. He is going to make a fun pet. If you would like to meet George and his brothers please contact us. George's sire is the famous Kiowa Sweet Trey and his dam is Legs Fidelity. Her raced 74 races at Derby Lane and got up to the top A level. George passed his cat and small dog tests so should be OK to live in a home with either.